The Dresses ... Miss N. Fairchild - Costume of cream crepe cloth, beautifully trimmed with gold and cream gimp; diamond ornaments. Mrs. Alex Macdonald - Heavy light green satin skirt with white chiffon trimmings; train long and trimmed with the same material; diamonds and flowers. Miss K. O’Donahue - Heavy cream Morveilleux silk; princess style; crystallized flowers. One can get some feeling for the era when the newspaper ads tell of hotel rooms at $2 for a single room with a ’detached’ bath, $3 for a room with a private bath, and $4 and $6 for a double. Afternoon tea was a feature from 4 to 6 p.m. Christmas season turkeys were listed at 25 cents a pound, wild ducks at 70 cents a pair and claret was $3.75 a dozen quart bottles. There were statements on how the cost of living was high, and there was a threatened postal strike. 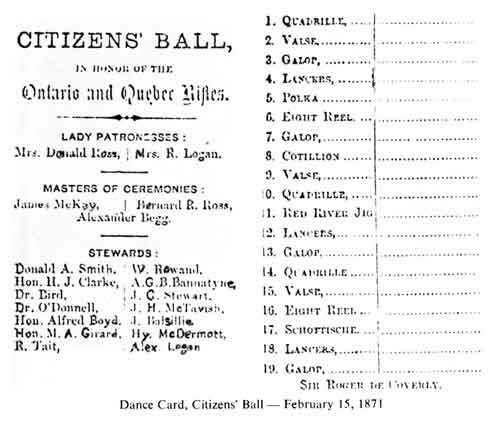 The era was recreated in part by the Manitoba Historical Society’s first annual Dalnavert Ball. 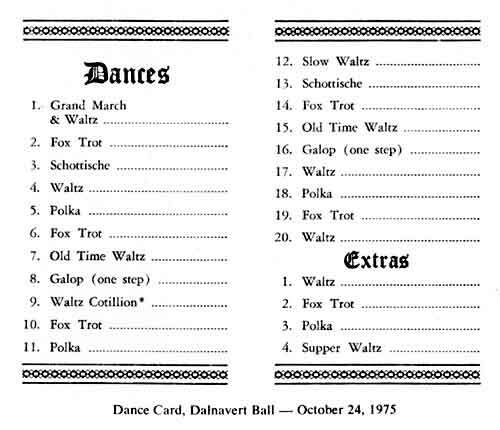 On 24 October 1975 the ball room again resounded to music of the pre 1930 times, the elegantly dressed ladies and gentlemen sampled punch, conversed with the special guests such as Sir Hugh John Macdonald’s grandson, Hugh Gainsford, and Lieutenant-Governor and Mrs. John McKeag, and waltzed and polkaed to the music of Pete Couture’s band. Cutaway jackets, satin gowns with low decoletage, white gloves, and military uniforms made the proper atmosphere for such a step back in time. The same chandeliers and now crimson drapes made a fitting surrounding for the graceful dancing of the Royal Scottish Country Dancers. Their swinging kilts, the piping, and the invitation to join in a waltz cotillion heightened everyone’s enjoyment. The hotel management outdid themselves in the cold plate served at the conclusion of the evening. The ’historic’ ball was deemed a success by all, and the Manitoba Historical Society is now planning a second such event. What better way to start a winter season than by dancing to music that recalls the high society events of the late Victorian era when Dalnavert was one of Winnipeg’s society mansions?